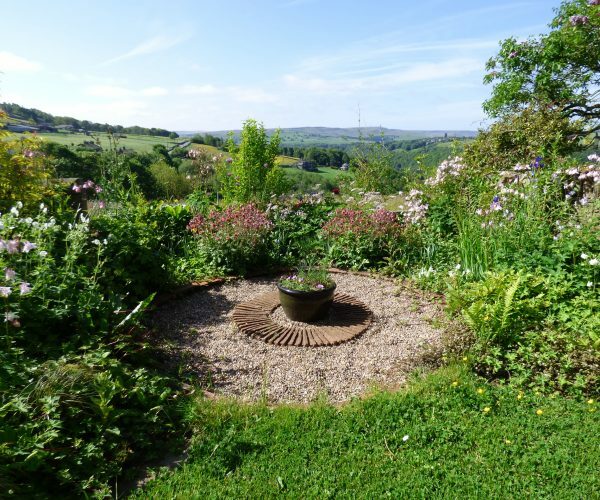 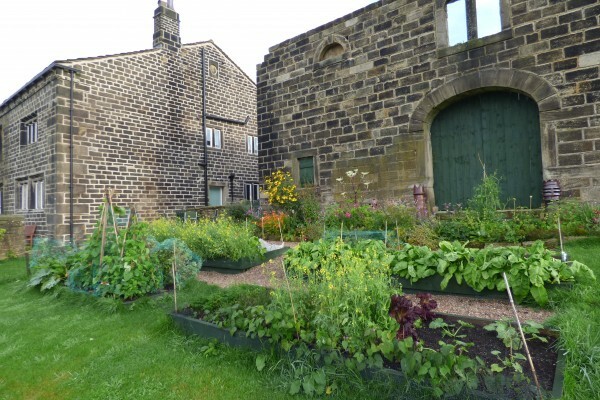 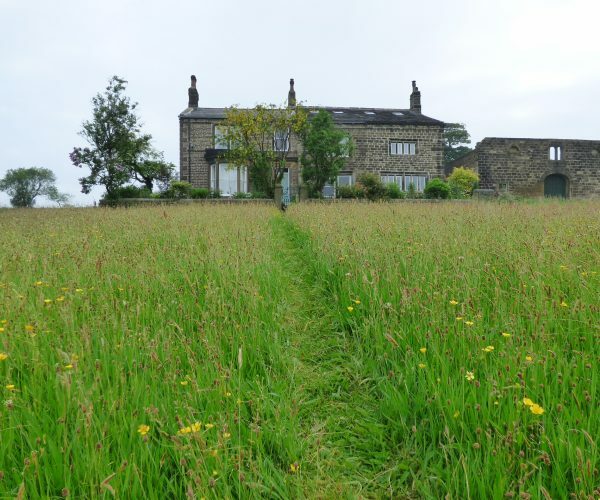 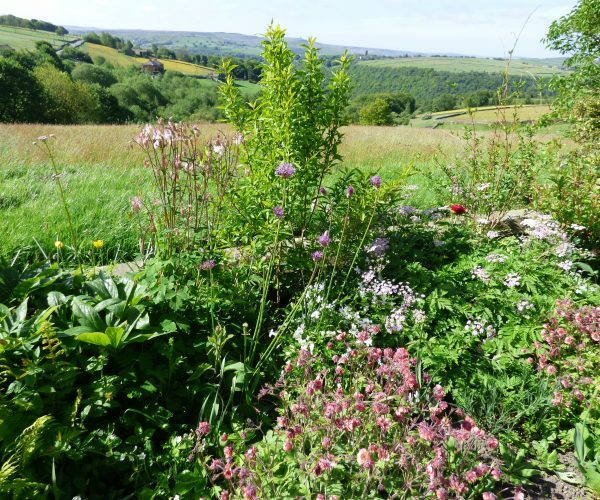 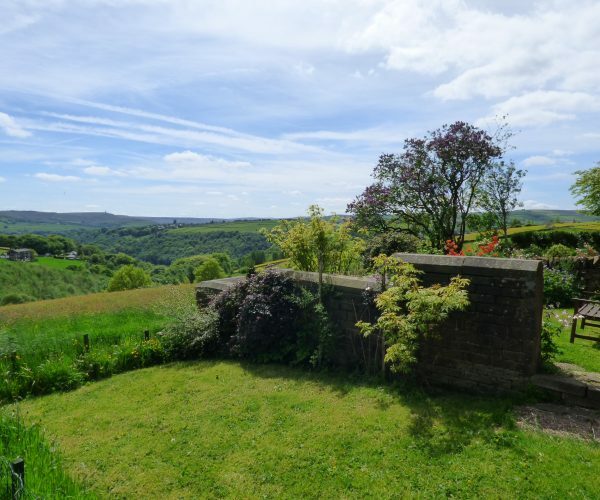 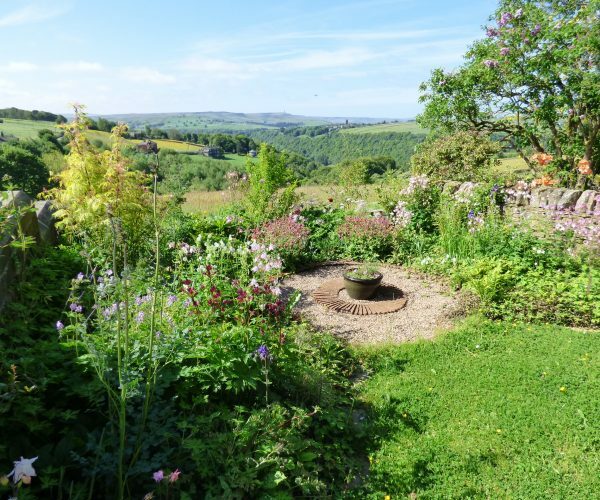 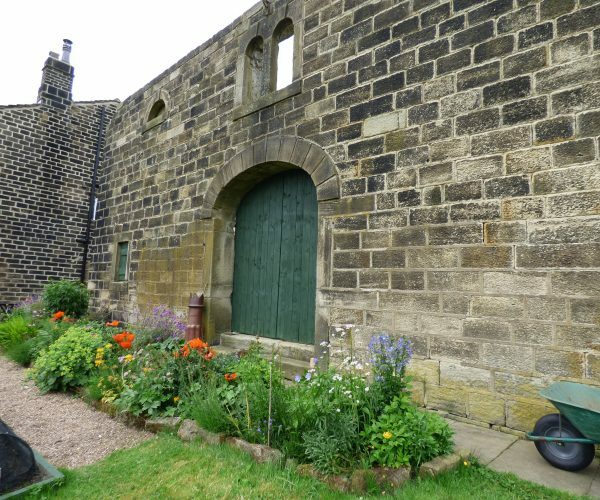 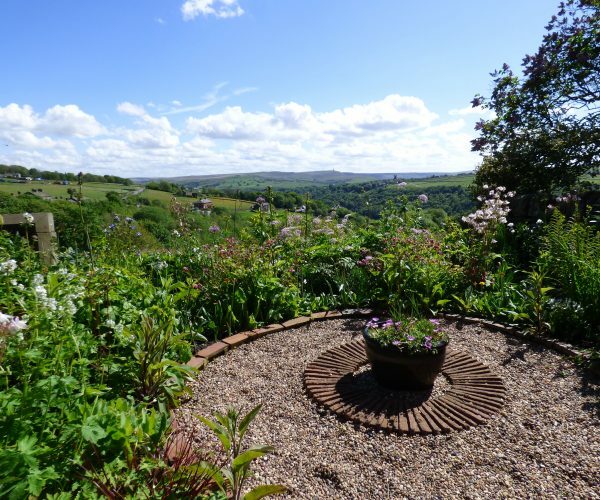 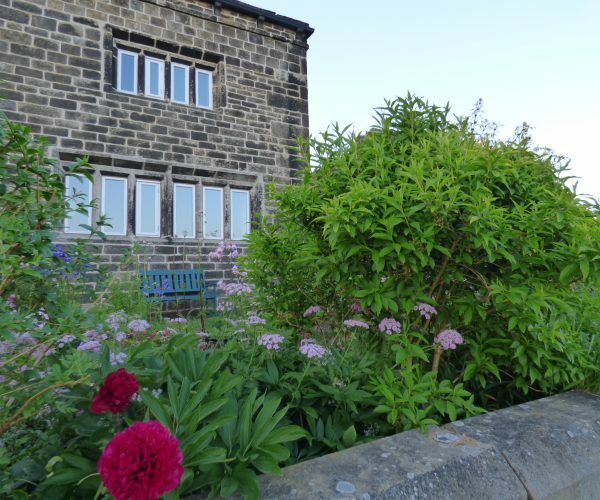 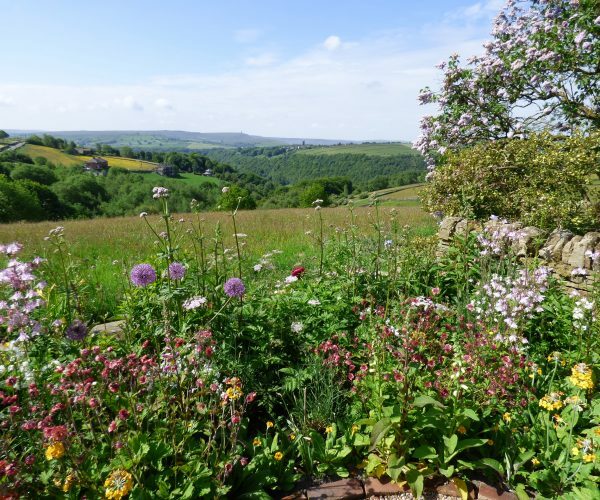 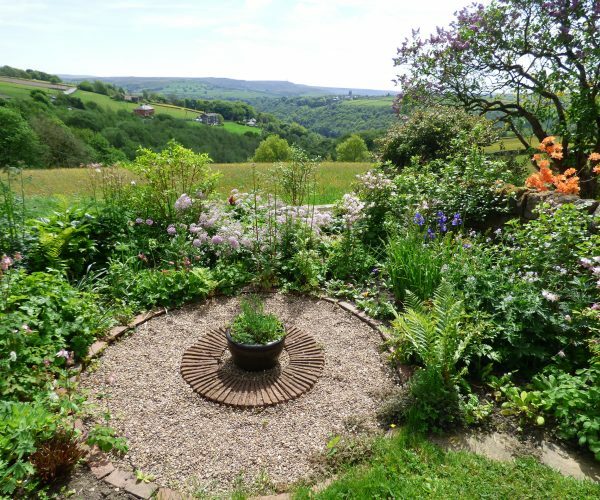 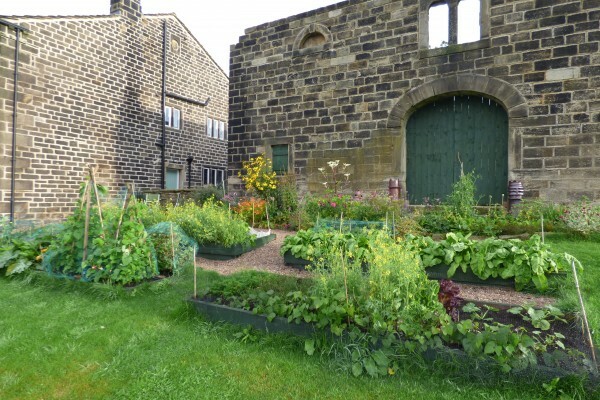 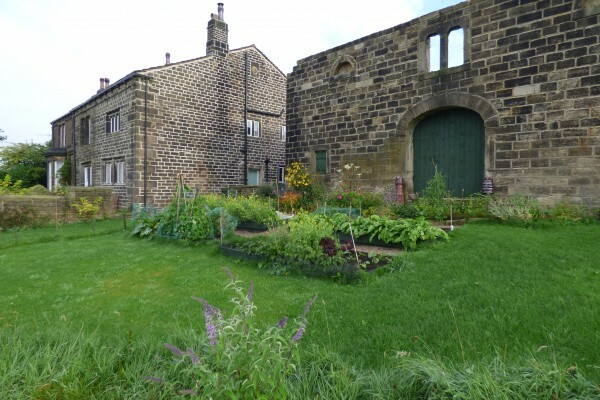 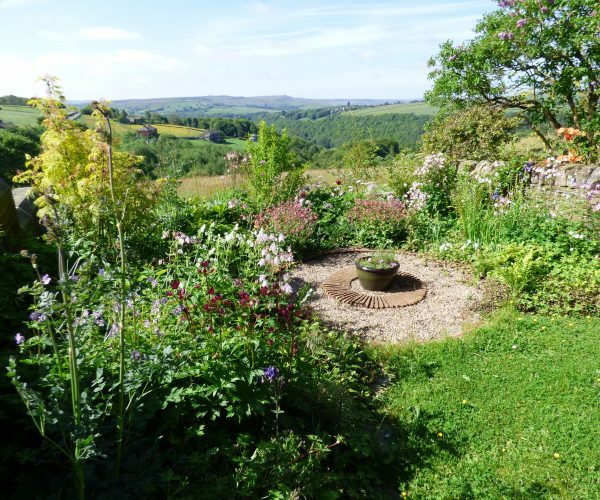 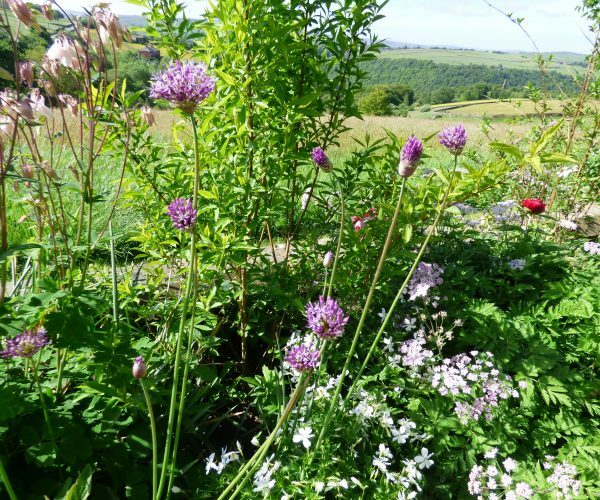 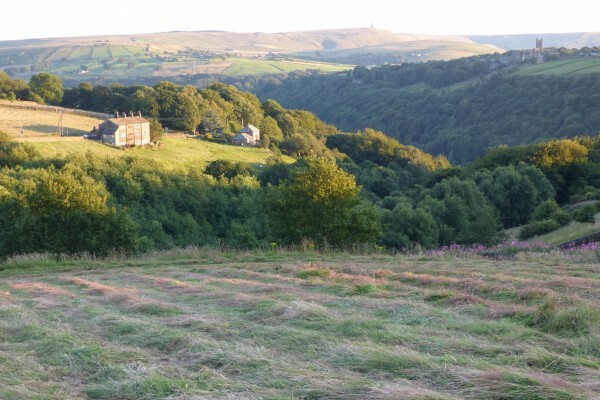 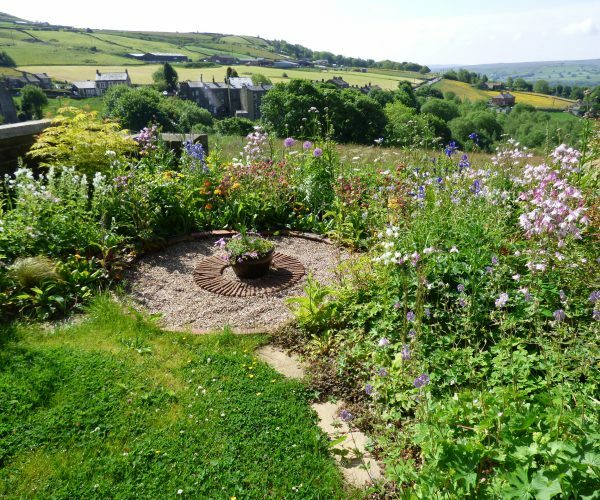 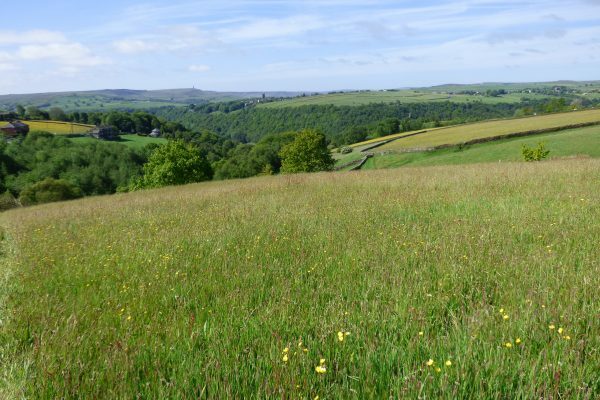 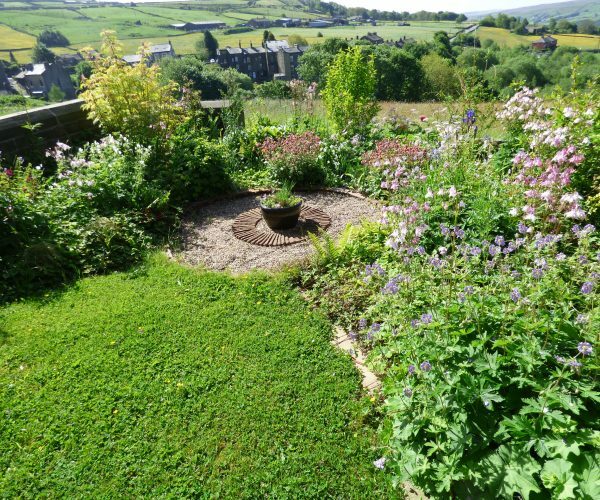 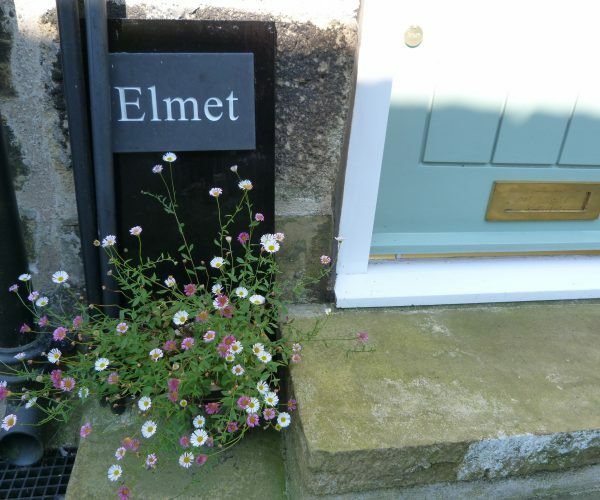 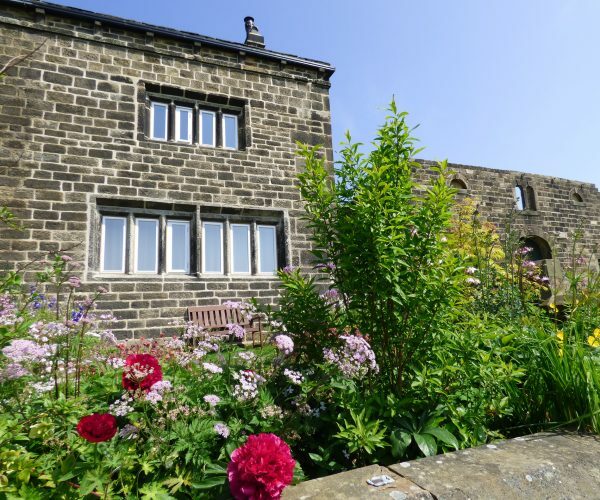 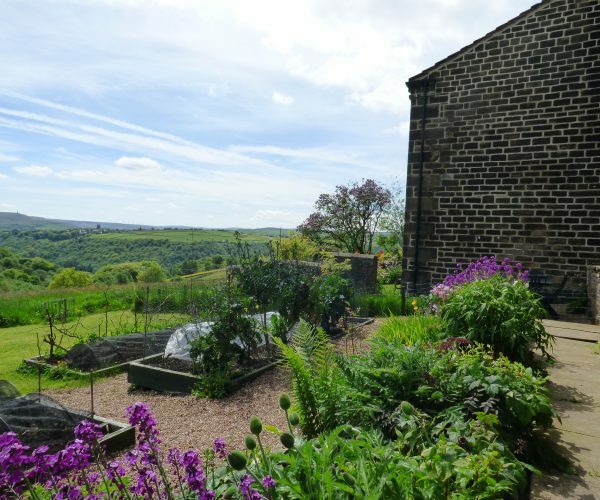 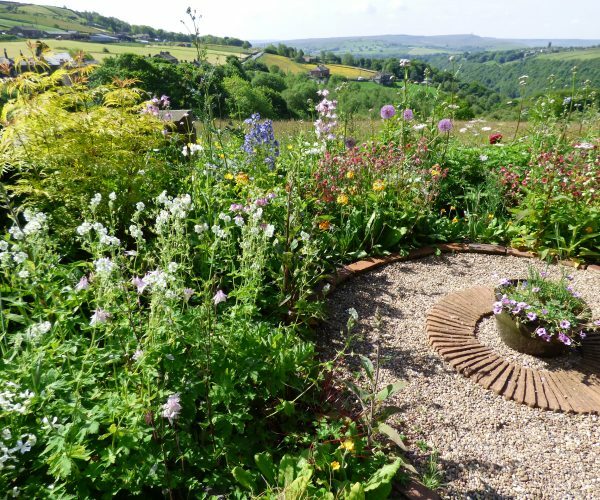 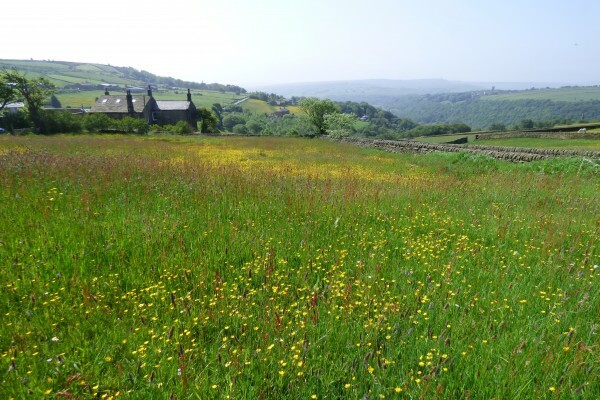 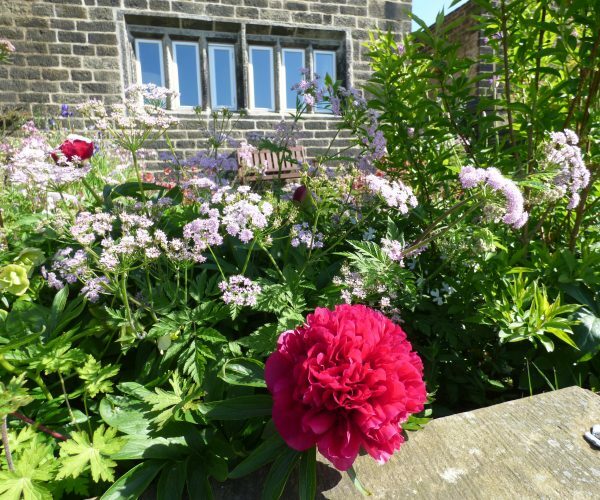 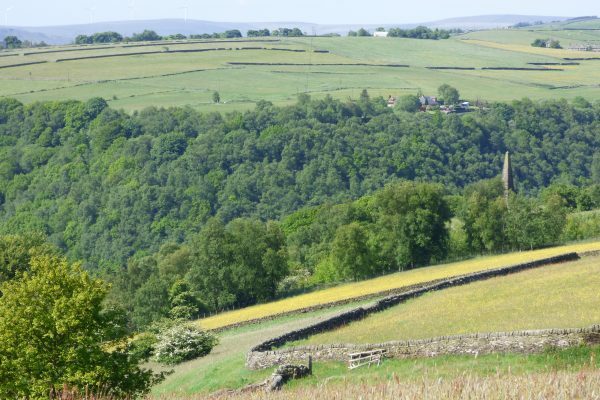 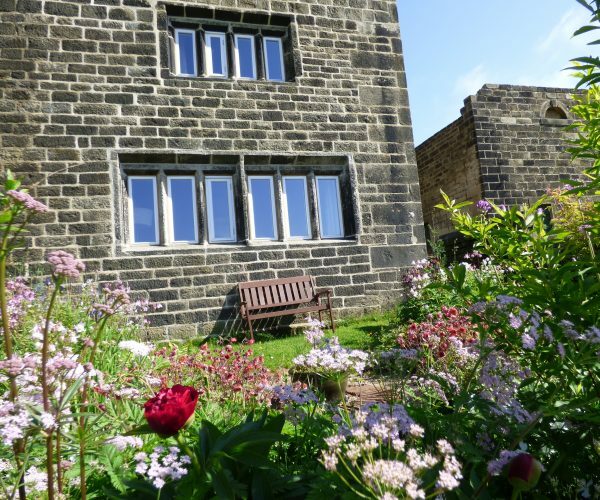 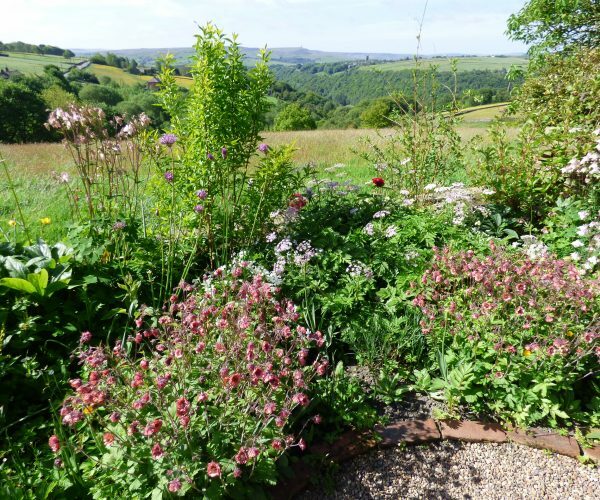 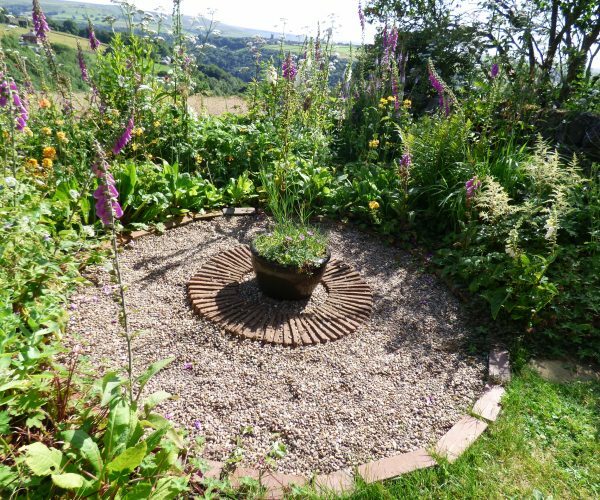 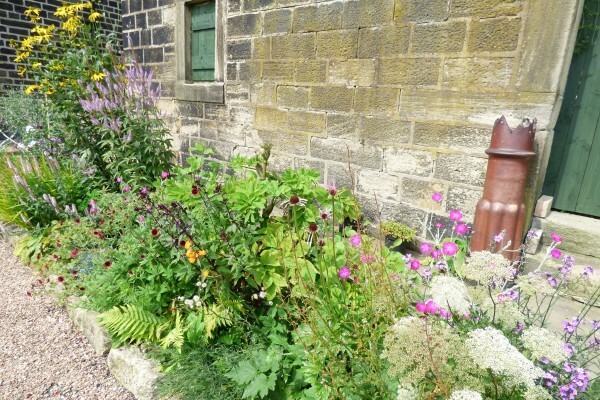 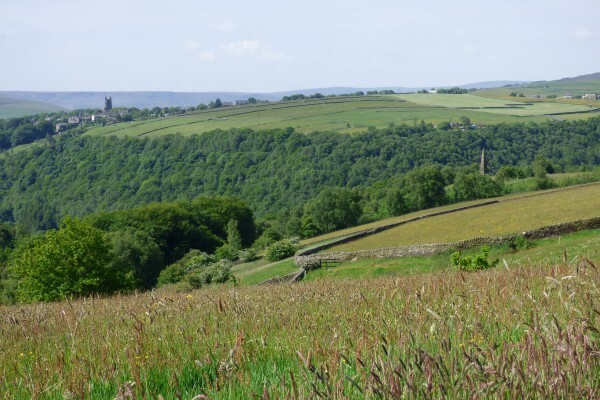 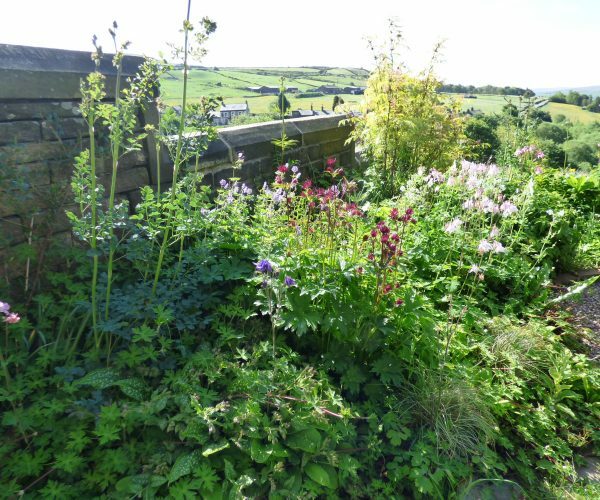 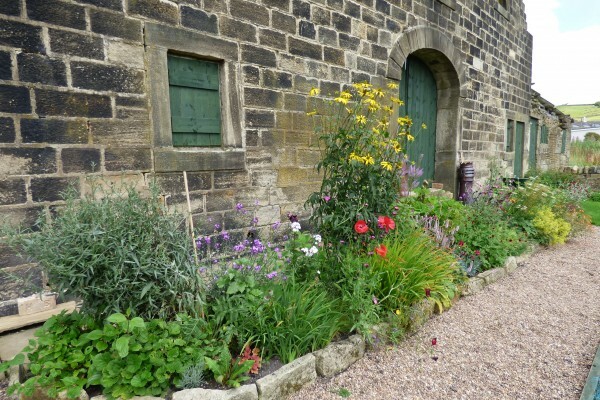 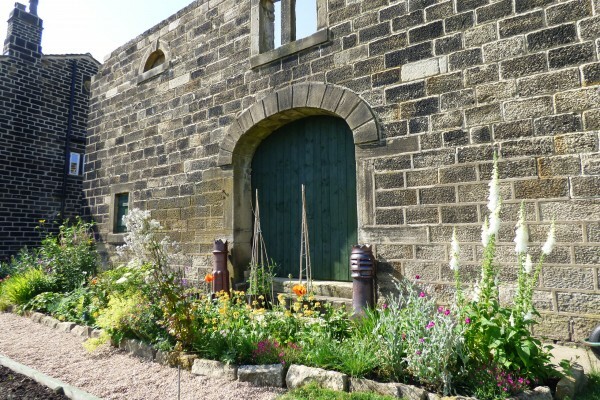 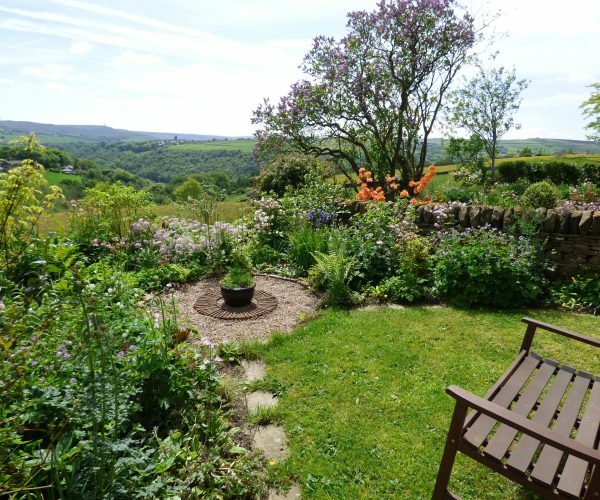 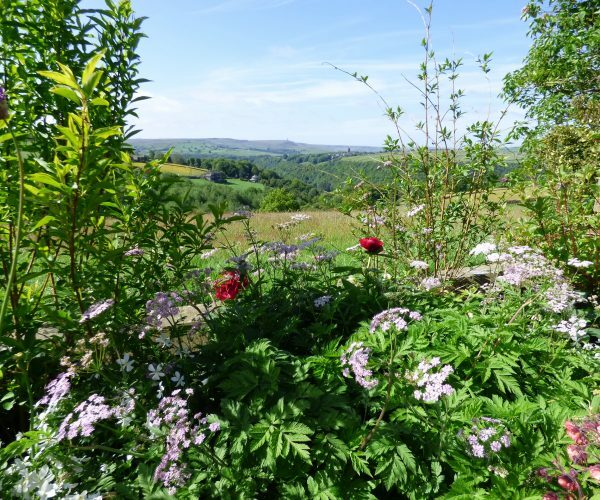 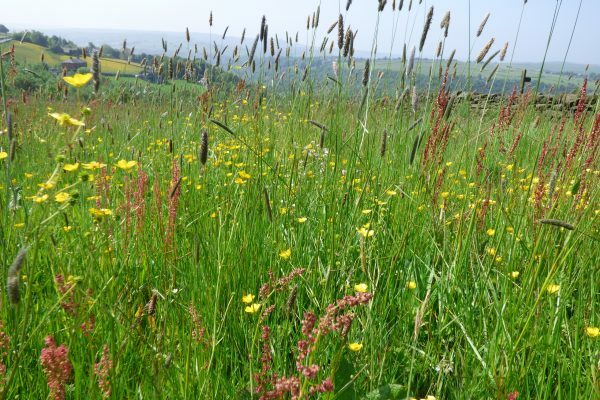 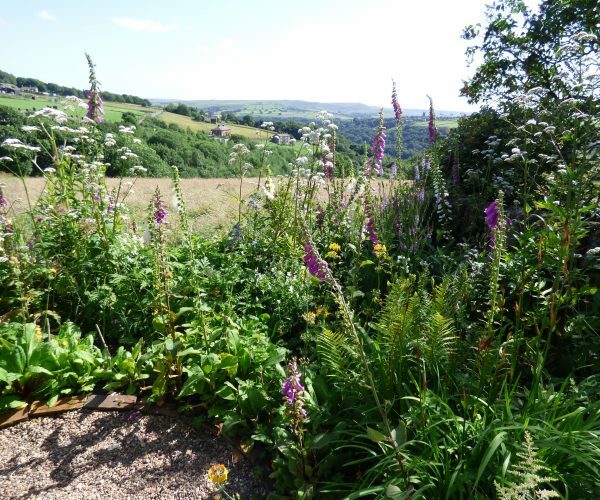 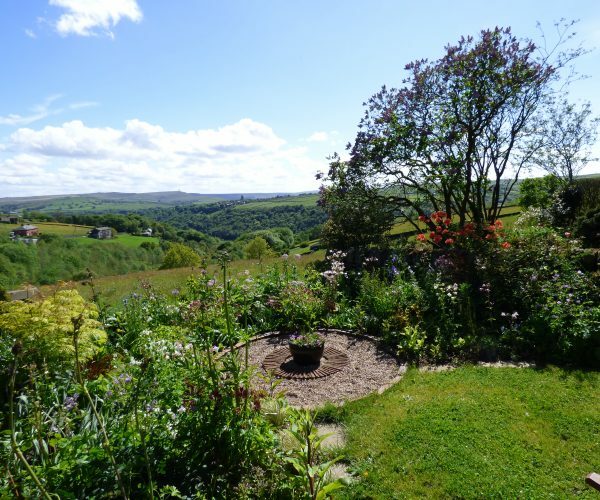 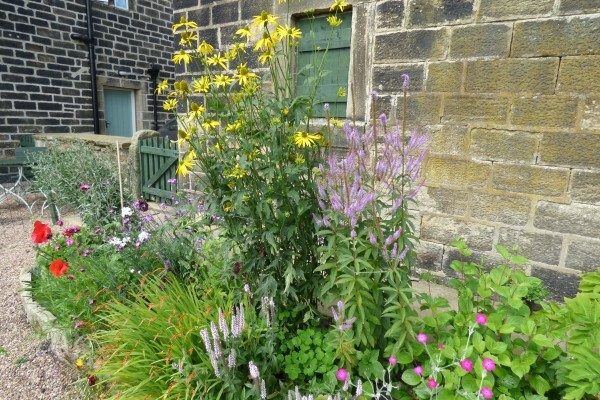 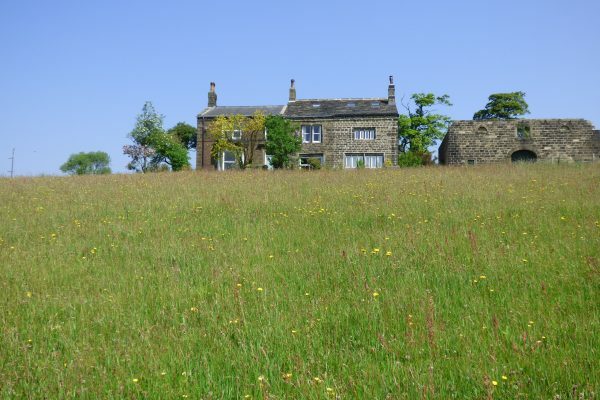 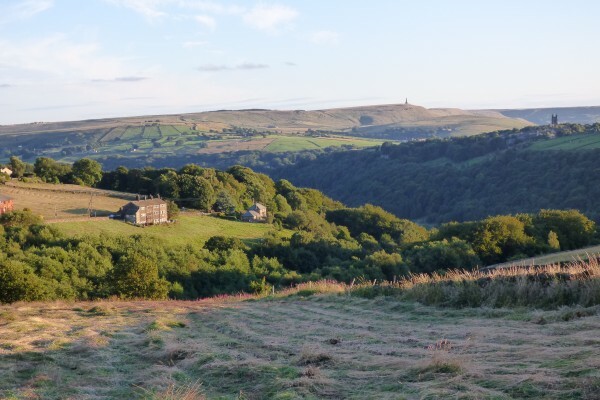 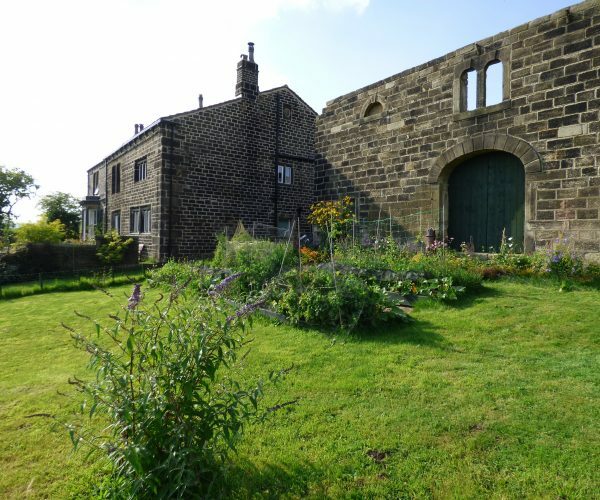 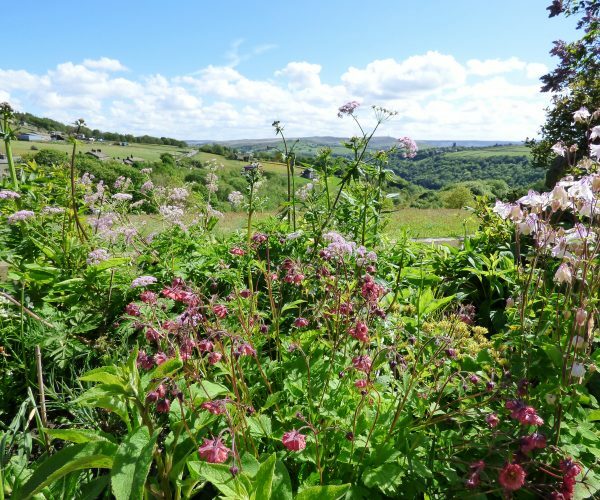 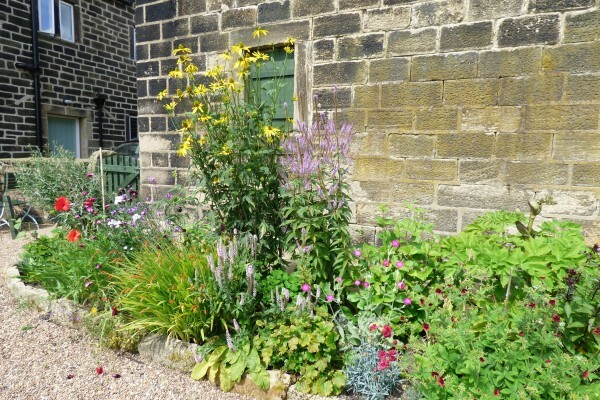 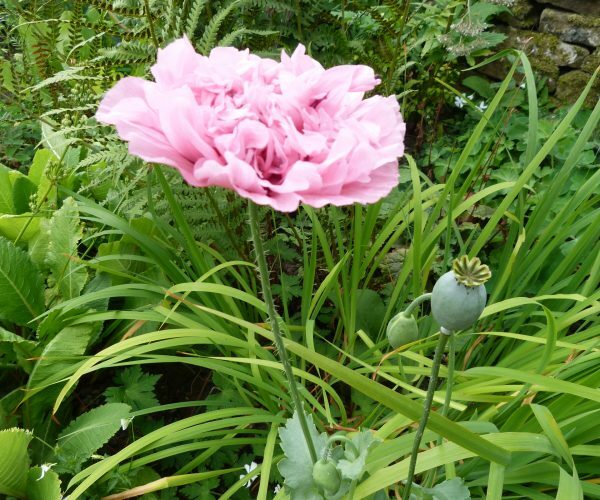 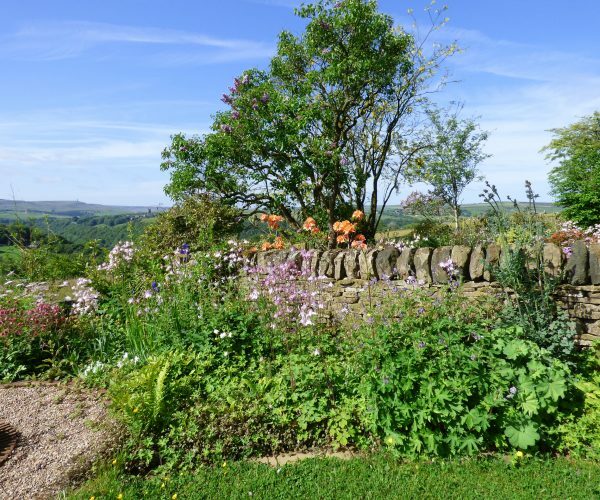 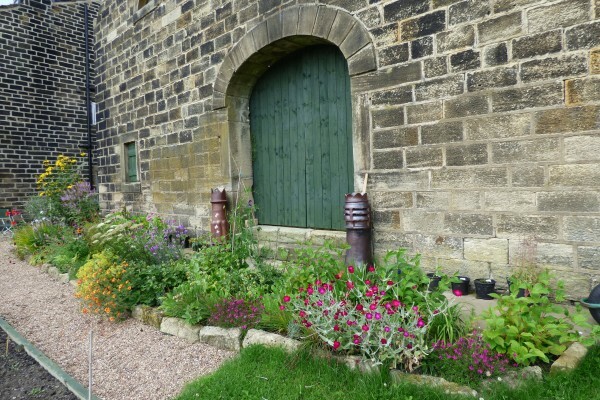 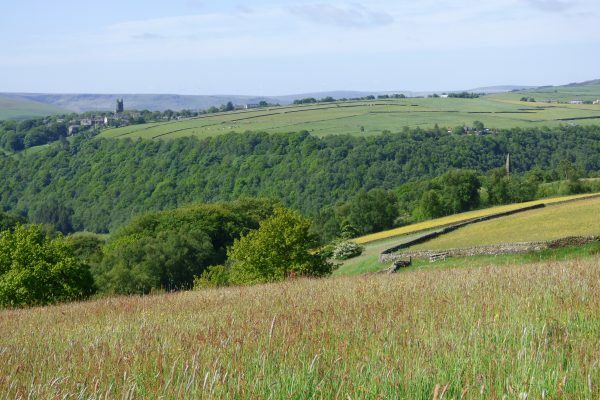 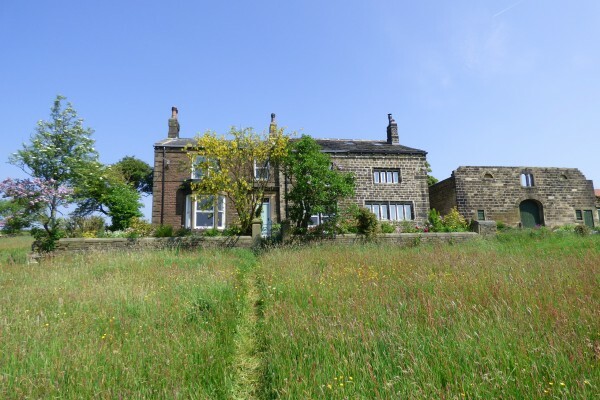 At the front of Elmet Farmhouse is a beautiful cottage garden overlooking the fields, with Stoodley Pike and Heptonstall Church in the distance. 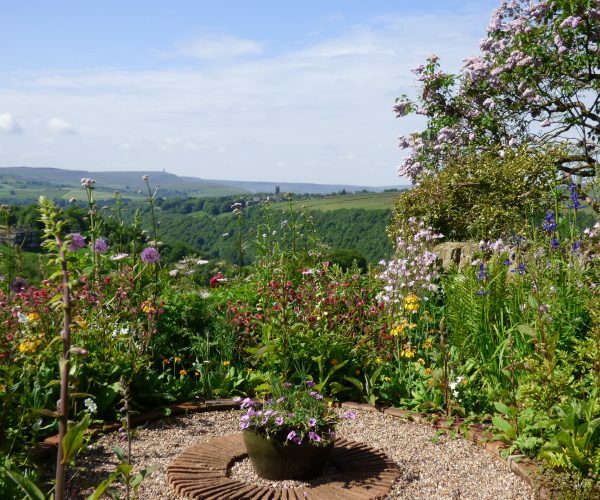 There’s a bench where you can sit and enjoy the flowers whilst soaking up the magnificent view. 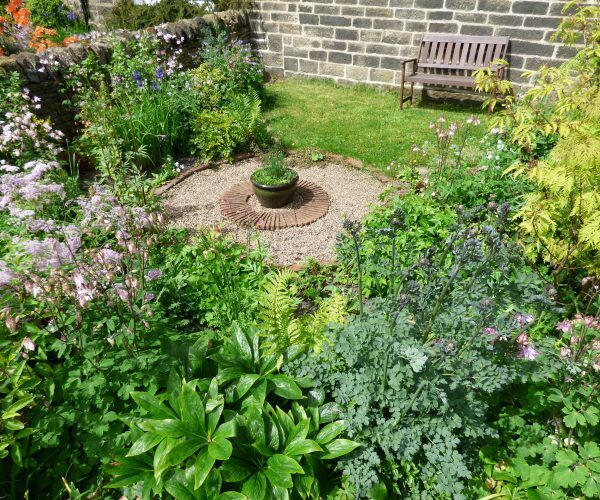 In the centre of the garden is pot planted with alpines and long-stemmed dianthus, surrounded a ring of terracotta tiles and a circle of gravel bounded by bricks. 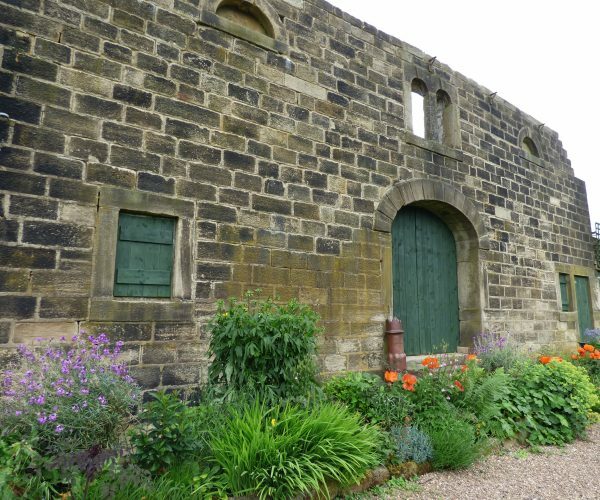 All the materials were salvaged during the restoration, including the stone paving. 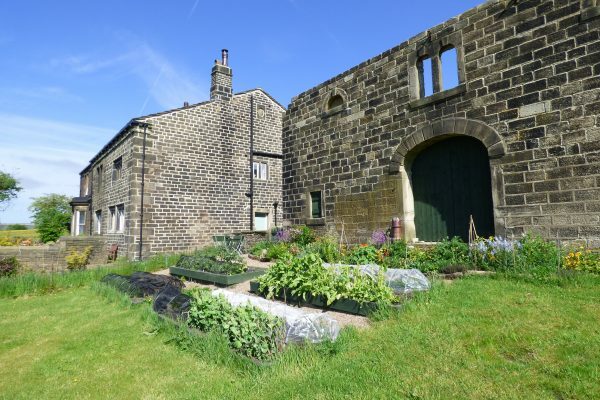 The tiles were in pieces buried in cow manure in the barn. 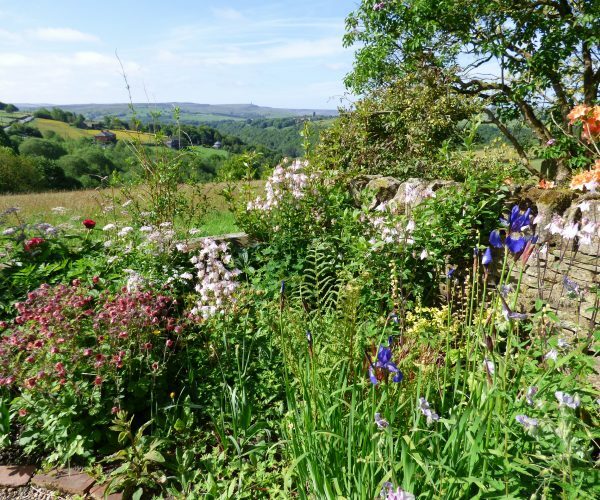 The garden is crammed full of flowers and has been designed so that there’s a sequence of plants coming into flower for most of the year. 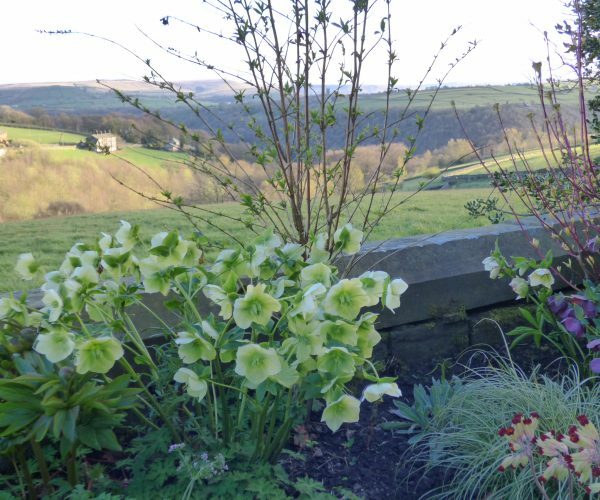 In late winter there are some lovely hellebores, followed in early spring by daffodils and primroses. 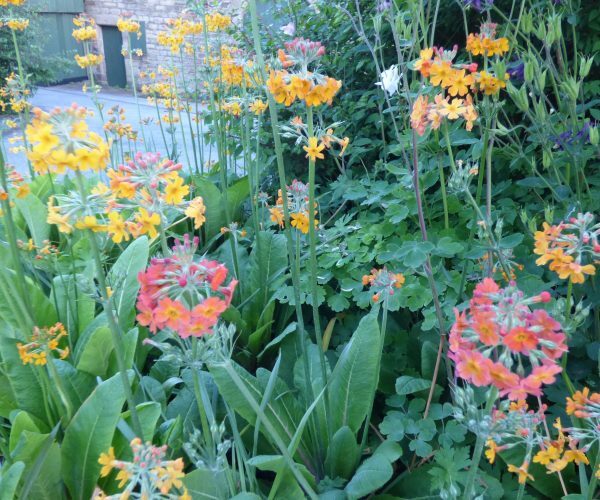 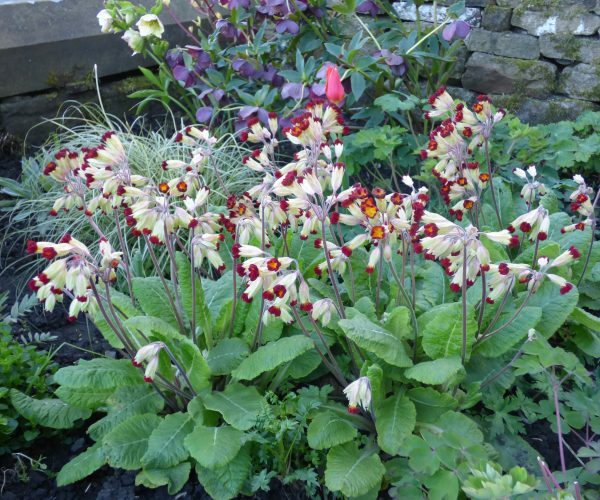 From late spring to early summer the garden is a mass of blooms, including geums, alliums, potentillas, aquilegia and bright orange candelabra primulas. 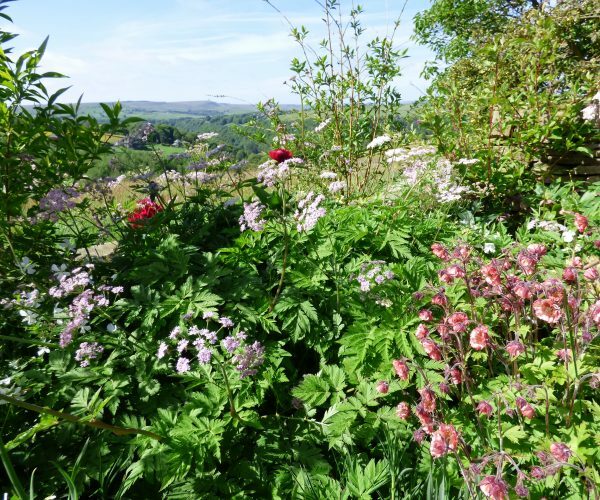 In midsummer, when the garden is at its peak, there are towering thalictrum and tall pink valerian, cascading white violas and a mass of wild foxgloves. 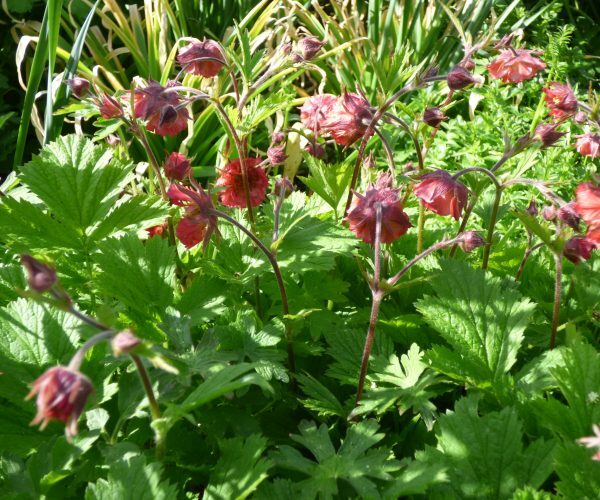 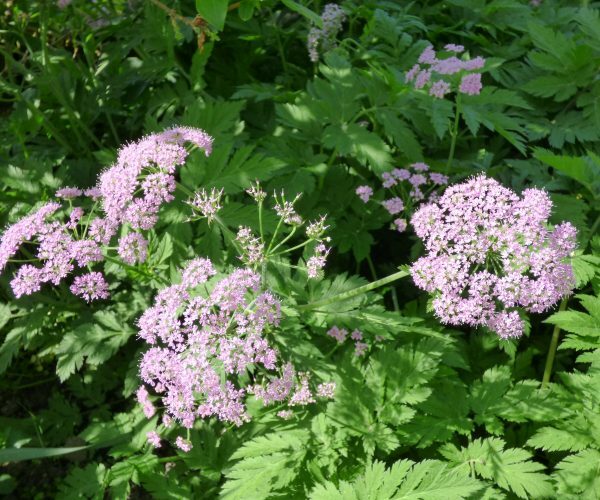 From late summer to early autumn, there’s still plenty of colour, including dark red astrantia, sedums and creeping purple-flowered hardy geraniums. 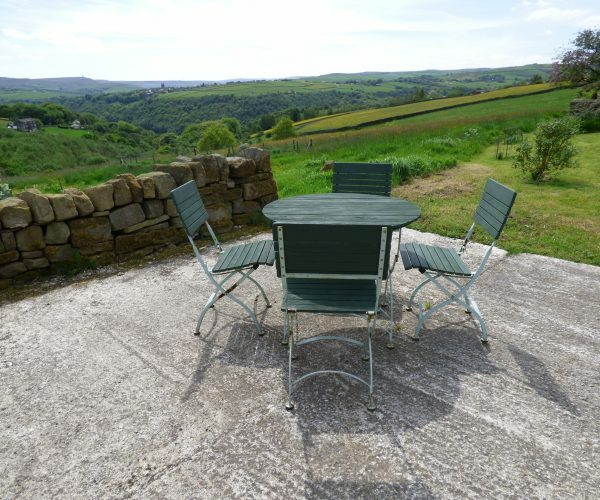 At the side of the farmhouse there’s another garden with an outdoor dining area. 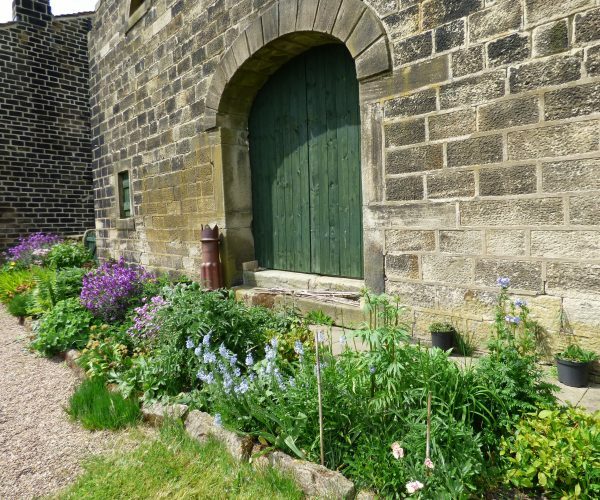 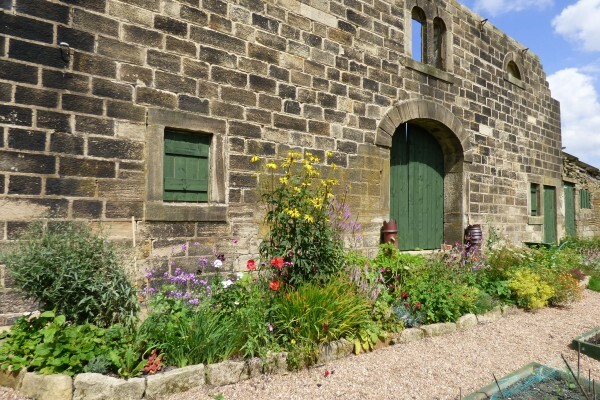 The lawn has been planted round the edge with spring bulbs – a variety of narcissi – and pink flowering clematis grows up the garden wall and the side of the barn. 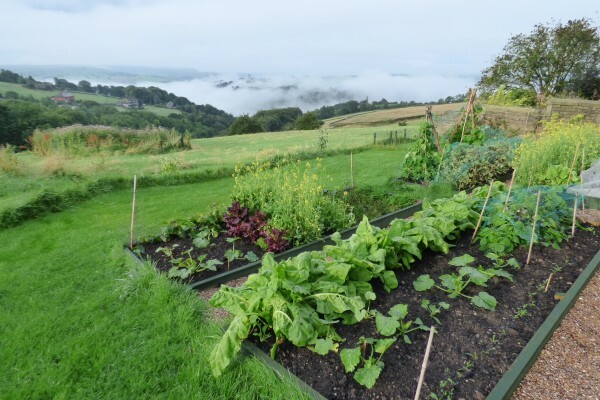 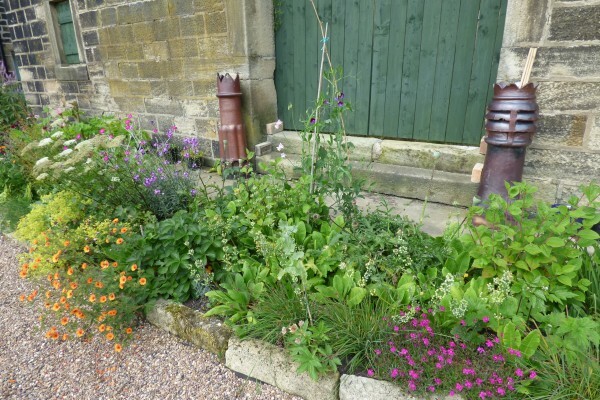 From here you can admire the owner’s vegetable beds planted with peas, beans, courgettes, spinach and rocket. 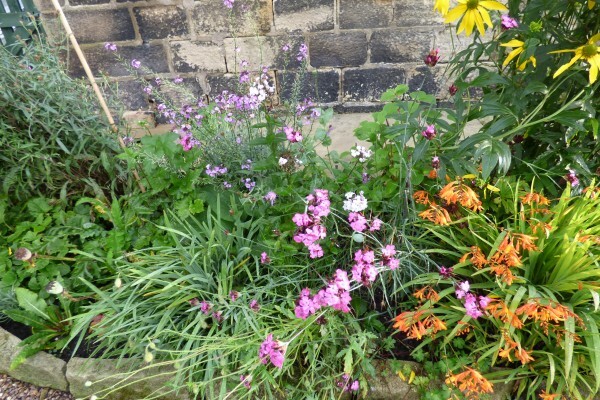 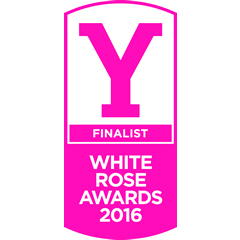 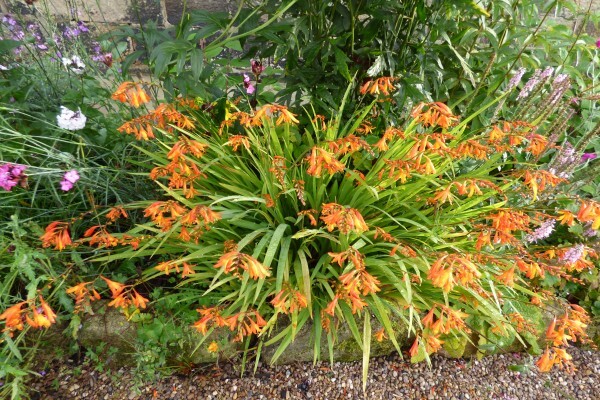 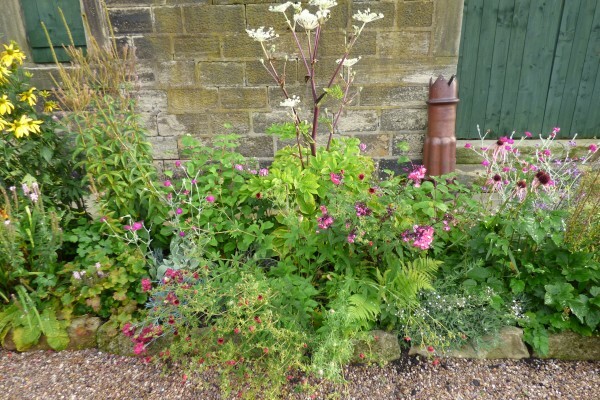 Running along the front of the barn is a long herbaceous border, planted with a varied and colourful array of shrubs and flowers. 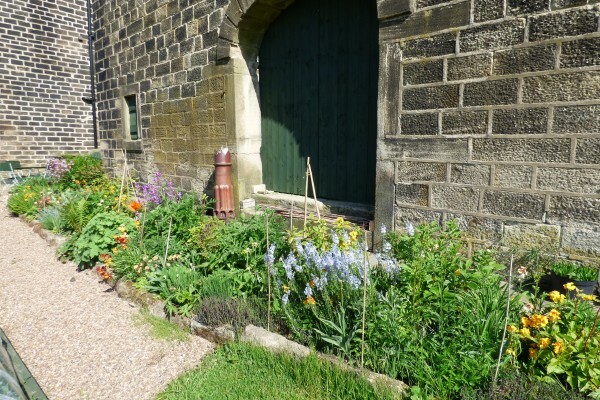 Because the garden is south-facing, it gets plenty of sun, which reflects off the stone walls of the barn. 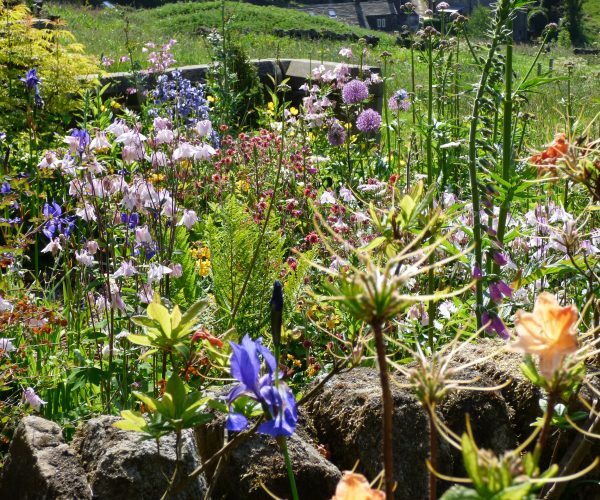 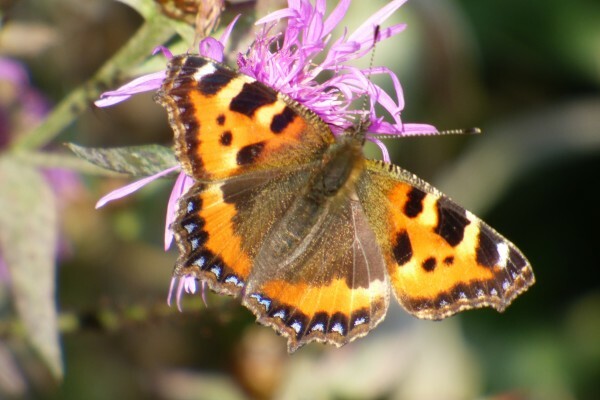 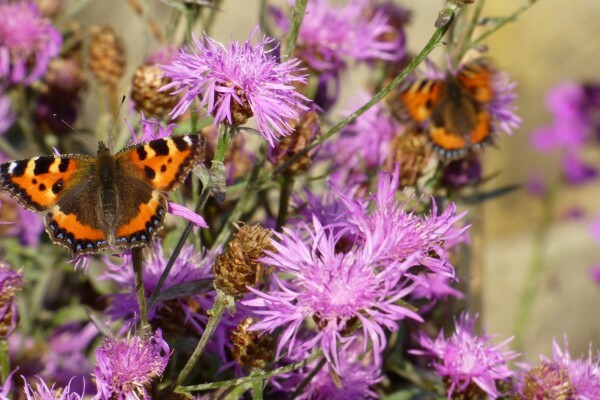 The flowers attract lots butterflies and bees. 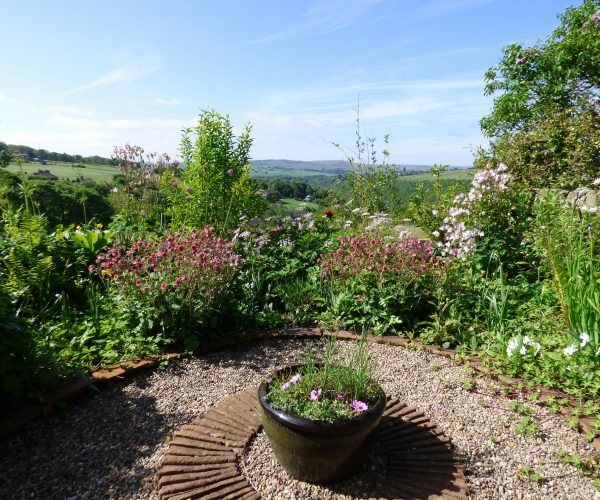 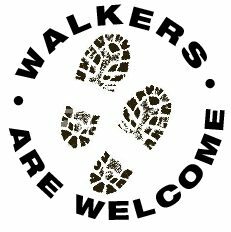 You’ll also see rabbits, pheasants and deer. 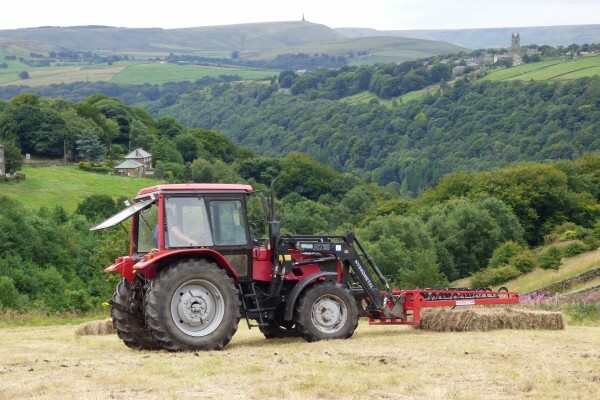 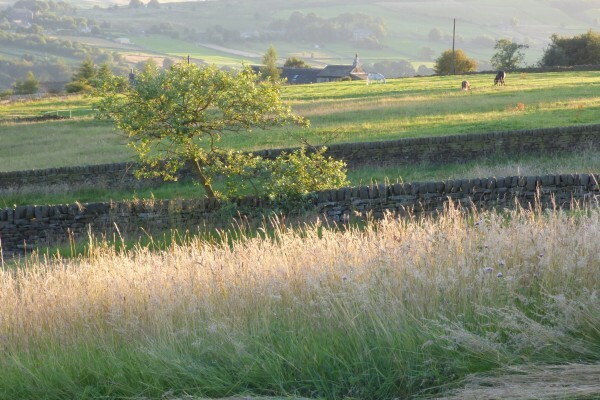 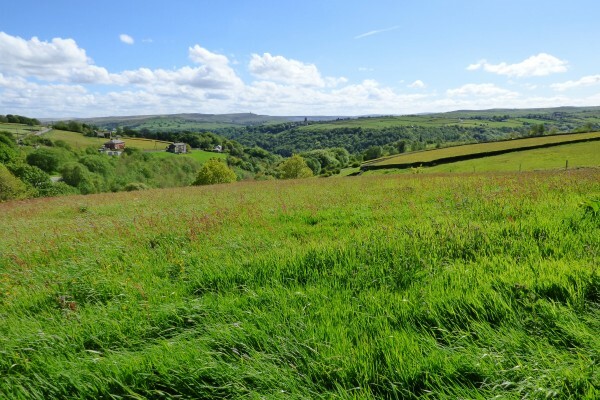 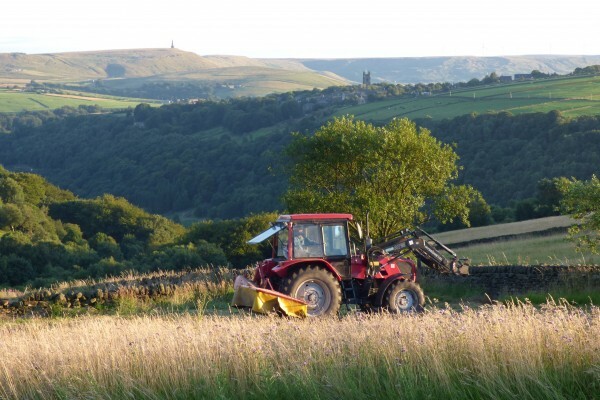 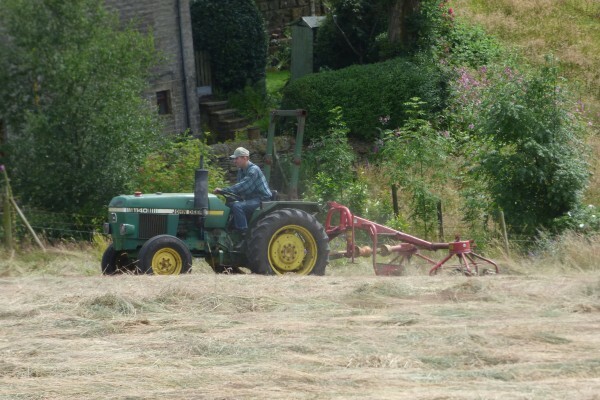 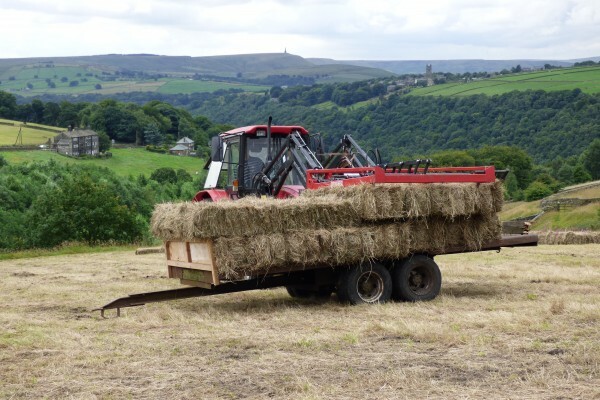 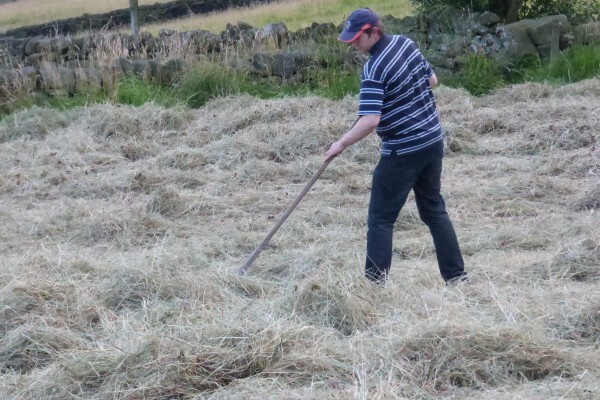 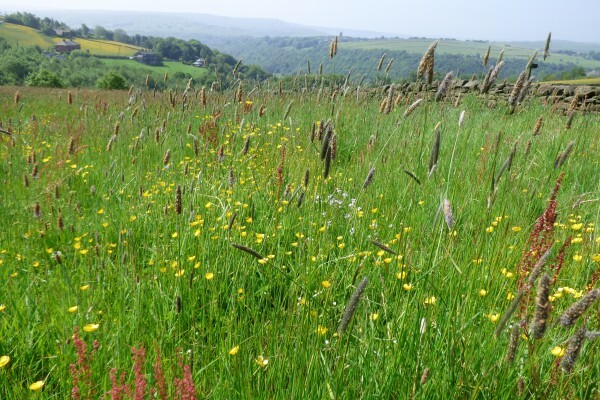 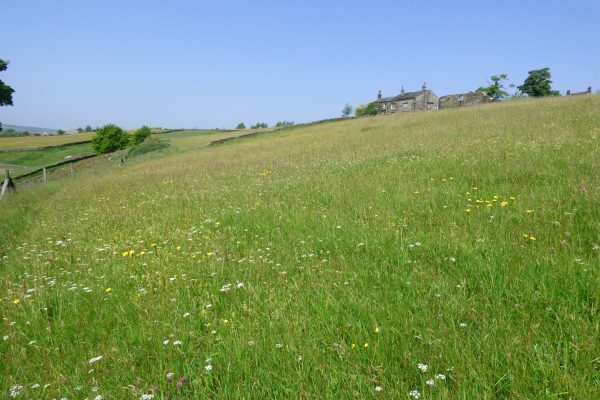 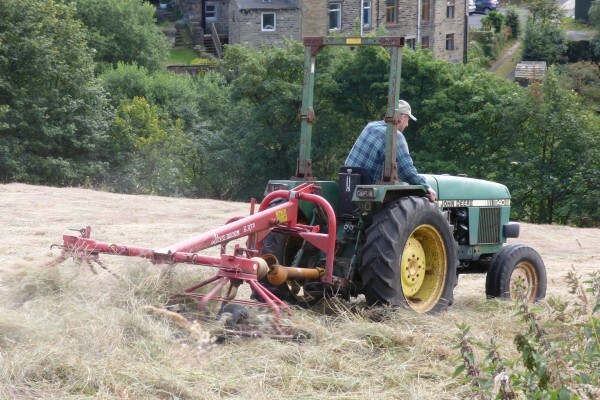 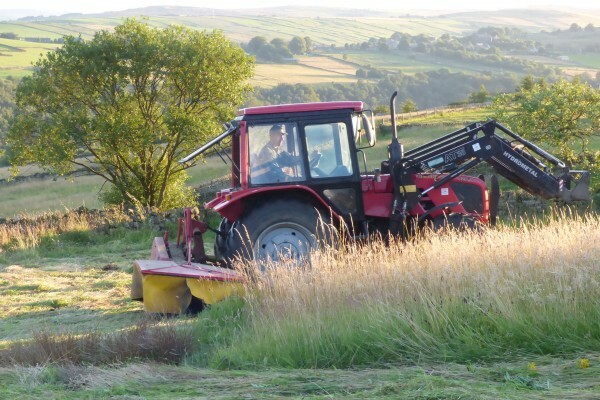 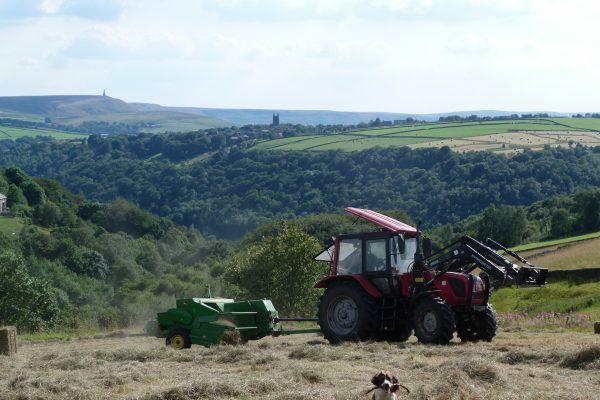 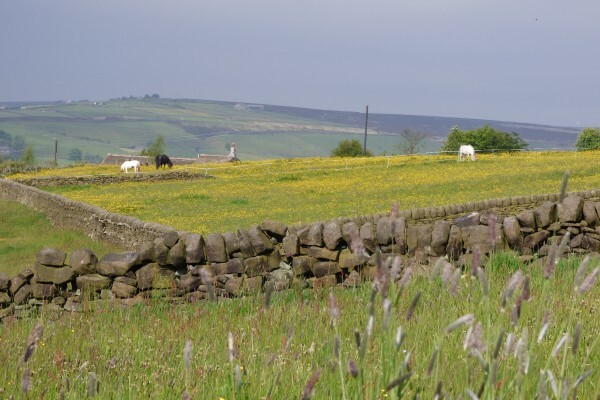 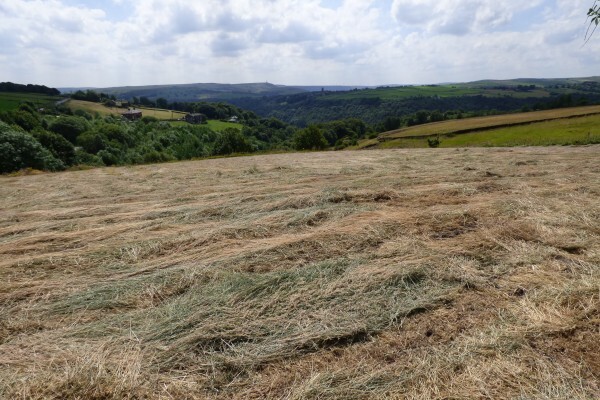 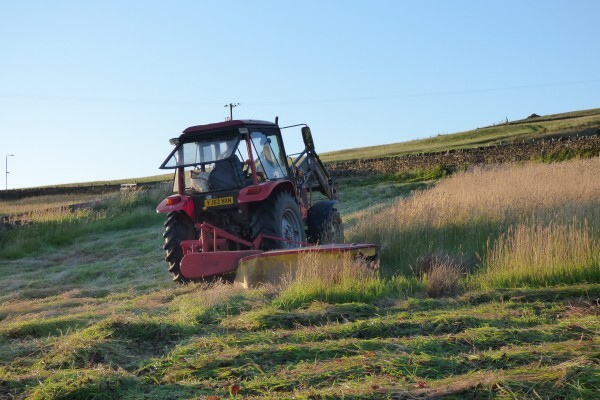 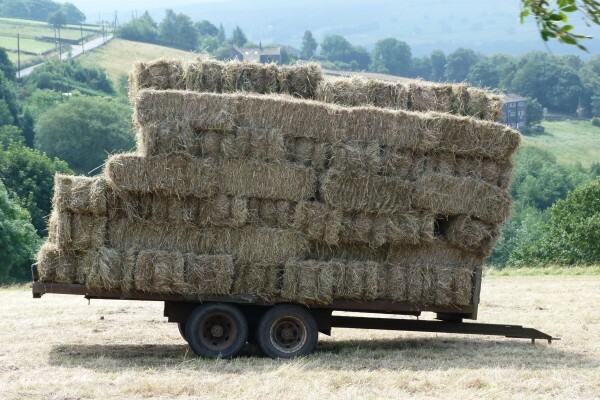 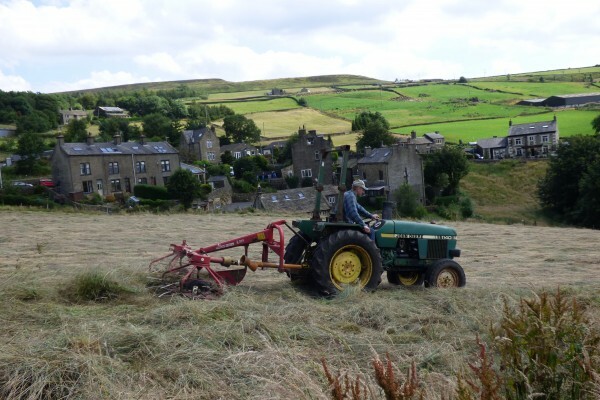 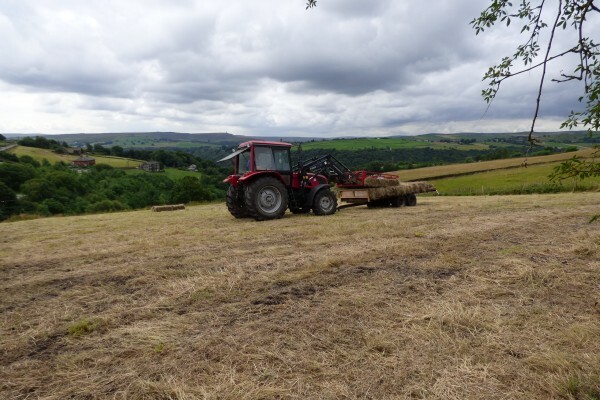 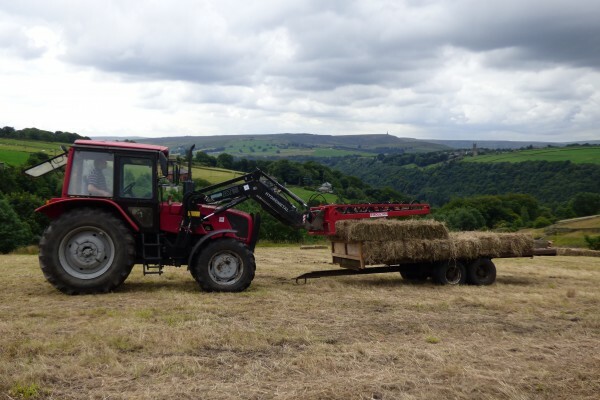 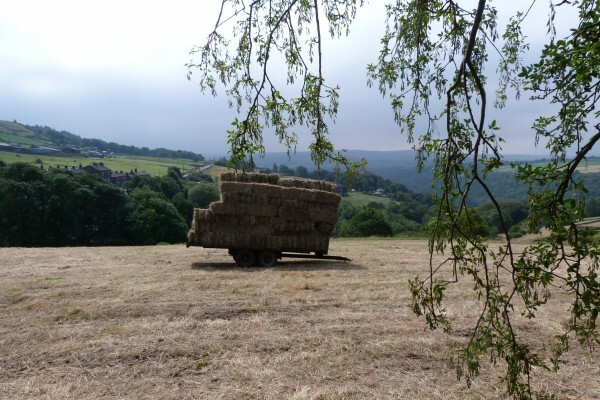 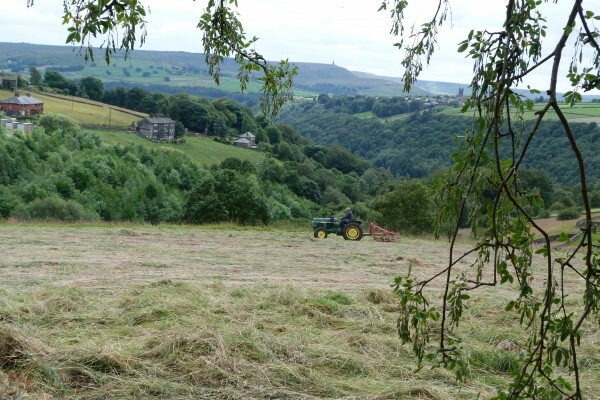 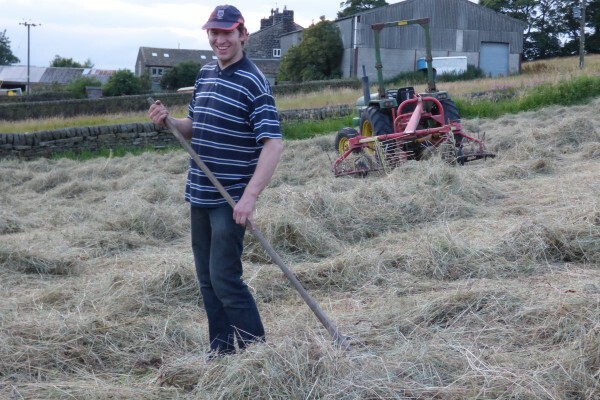 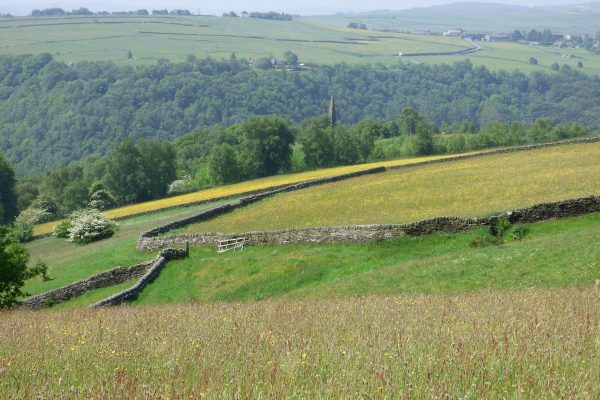 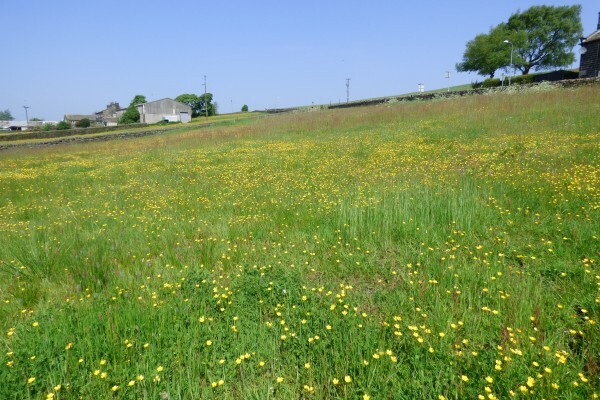 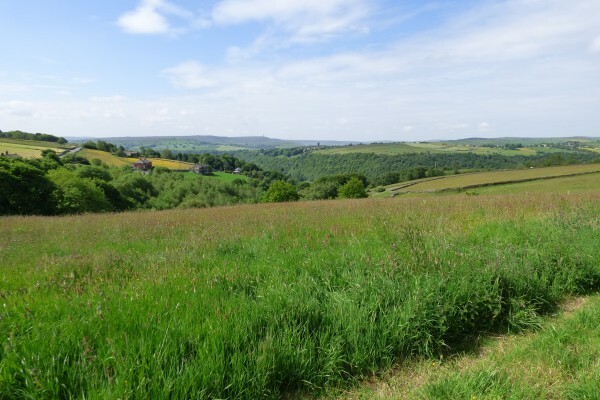 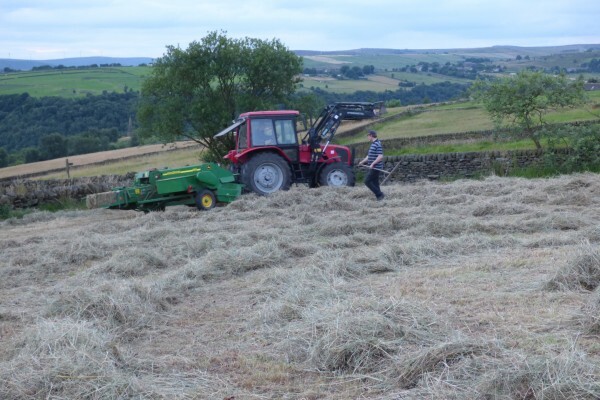 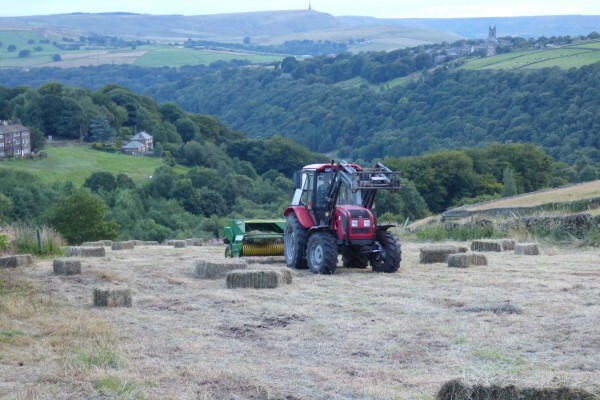 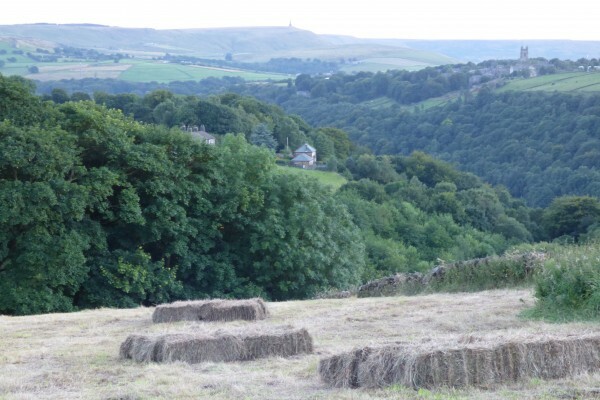 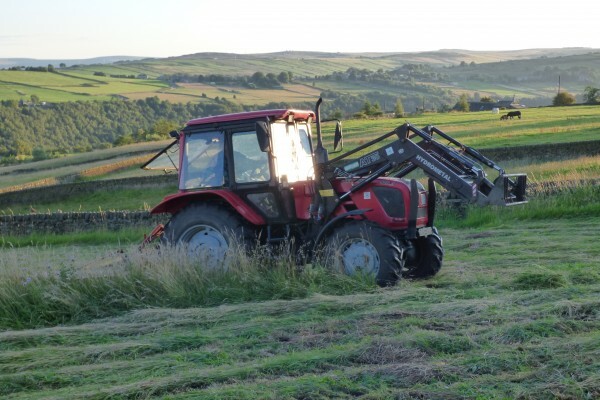 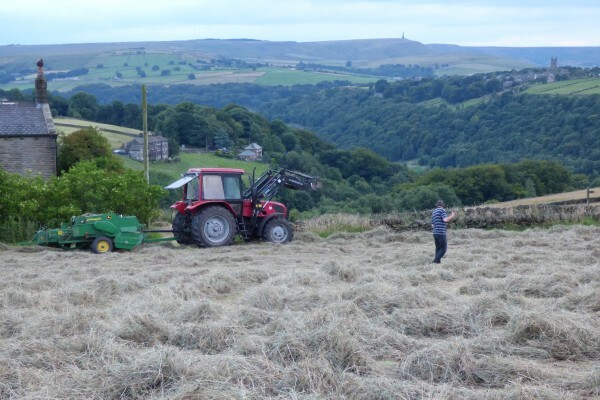 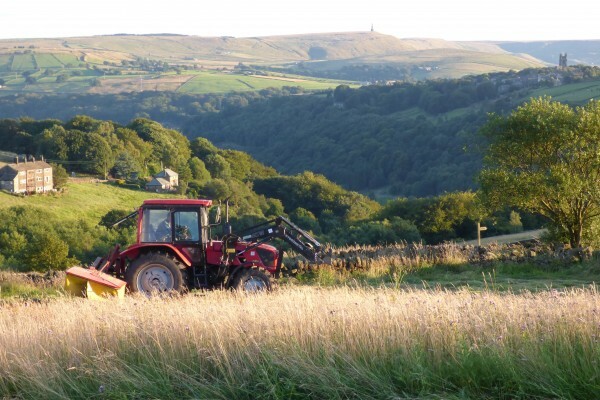 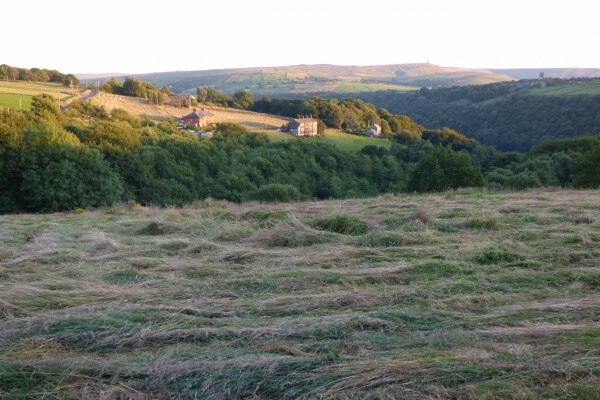 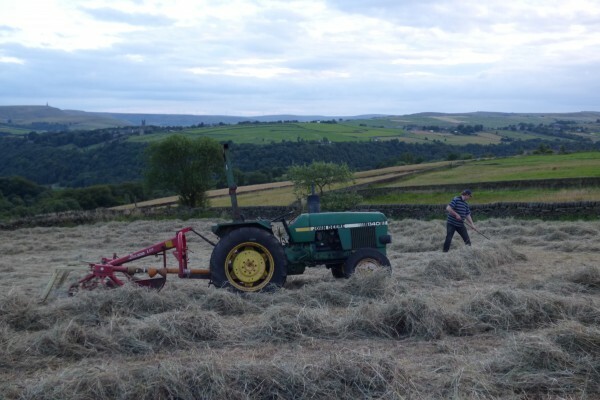 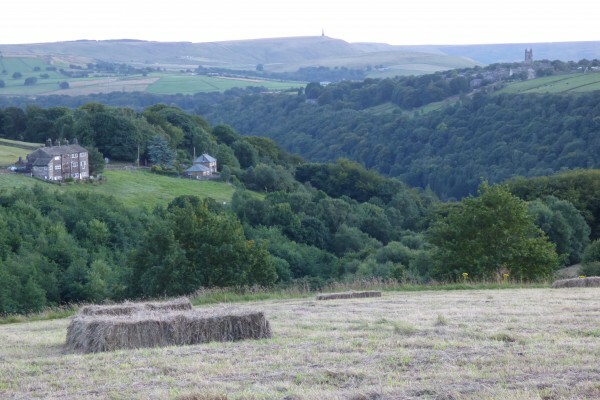 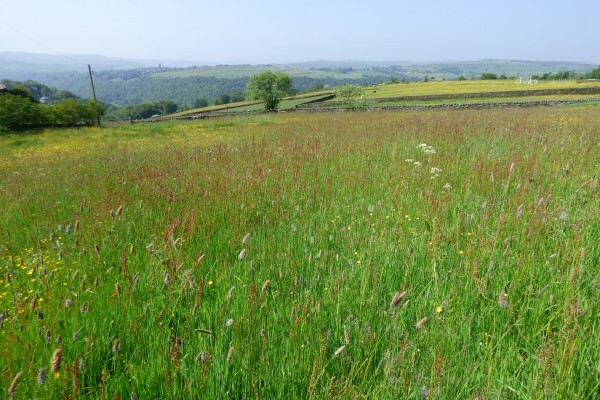 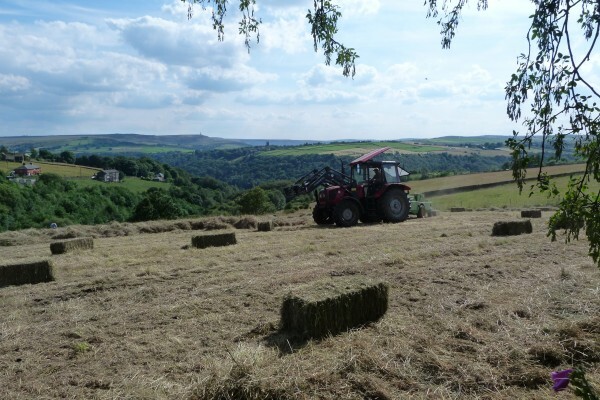 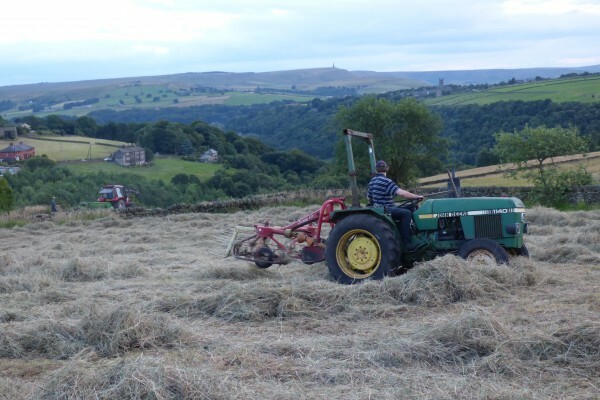 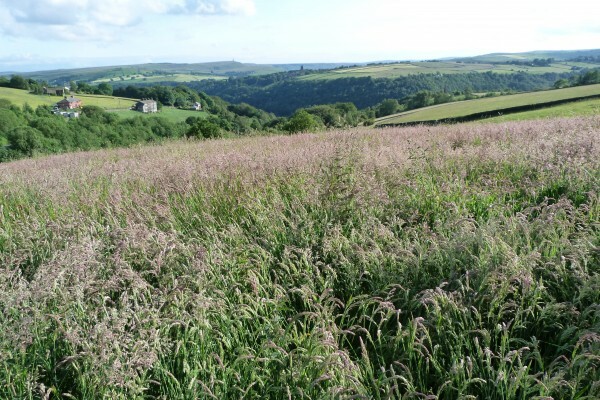 The fields surrounding Elmet Farmhouse are grown for hay each summer. 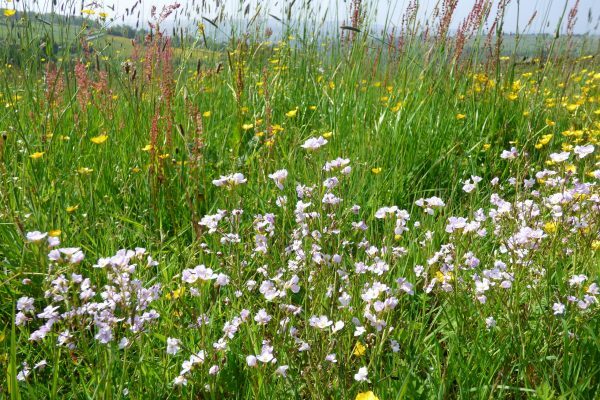 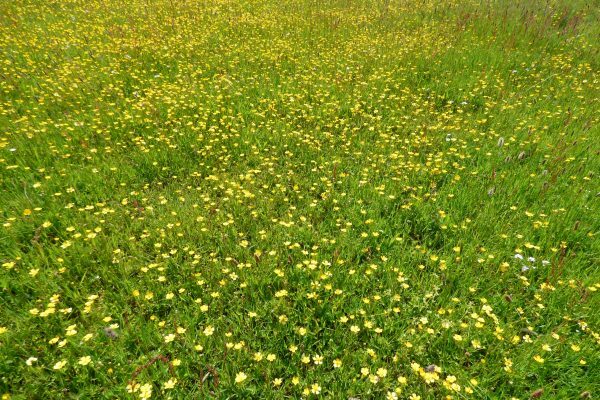 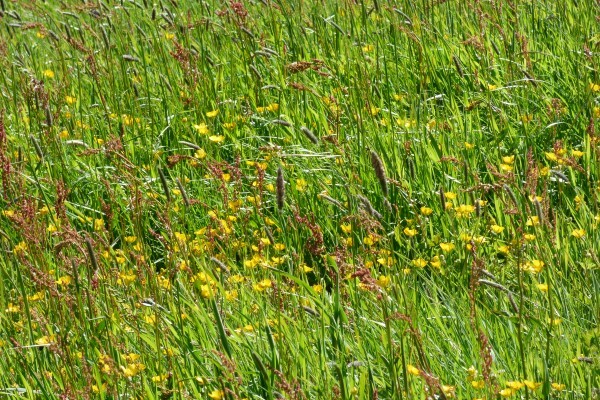 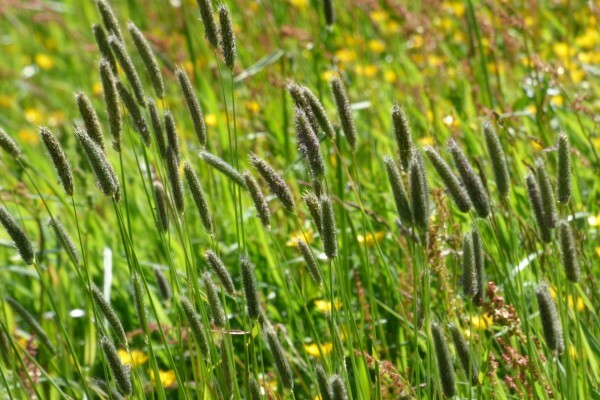 As well as feathery grasses, they are full of wild flowers, including buttercups and sorrel. 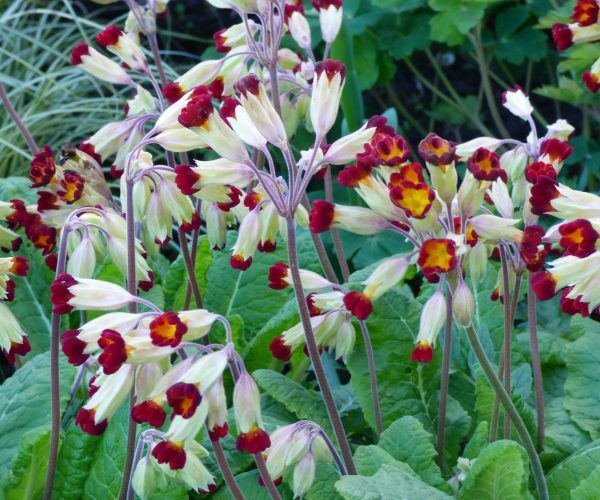 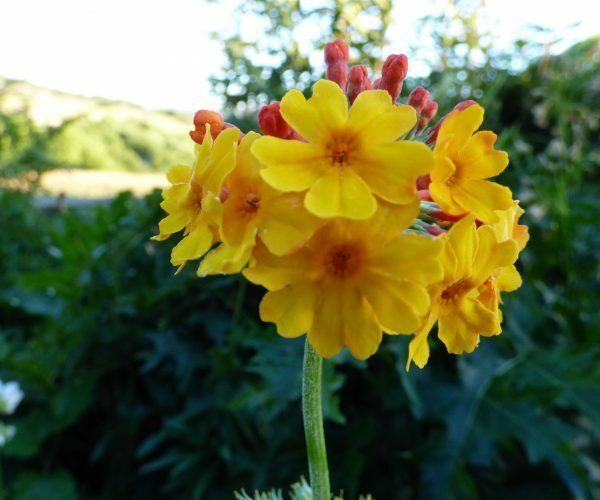 During the spring they turn from bright green to golden yellow tinged with red, providing a wonderful backdrop to the garden. 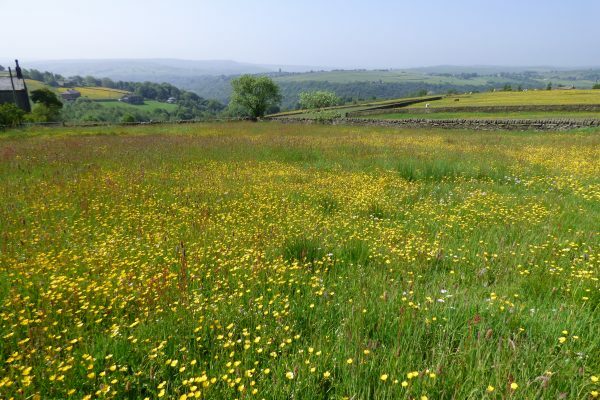 Watching the meadows grow to their full height is one of the pleasures of midsummer.